Author’s Note: Thanks to everyone for their patience while I took my break! We’re picking right back up where we left off, continuing Round 8 with the Blanks. Time snuck up on Heaven. 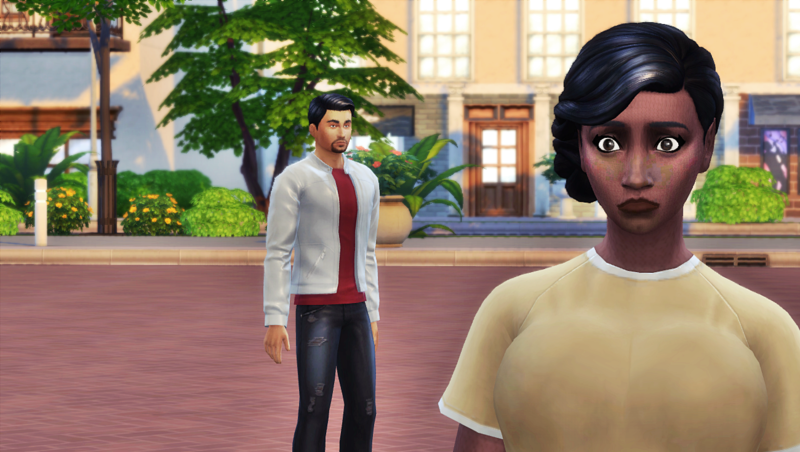 She fully intended to speak to Bo about the pregnancy, and seek his input on how to handle it. But when she went to see Gem and Asa before she was showing, Bo made her leave without seeing them. She was so hurt, she couldn’t talk to him about it then. Her roommate Kian told her that he met her husband. He was walking past the house and Bo came to introduce himself. Heaven already felt bad enough without worrying that she put her roommates in a position to have to lie to her. 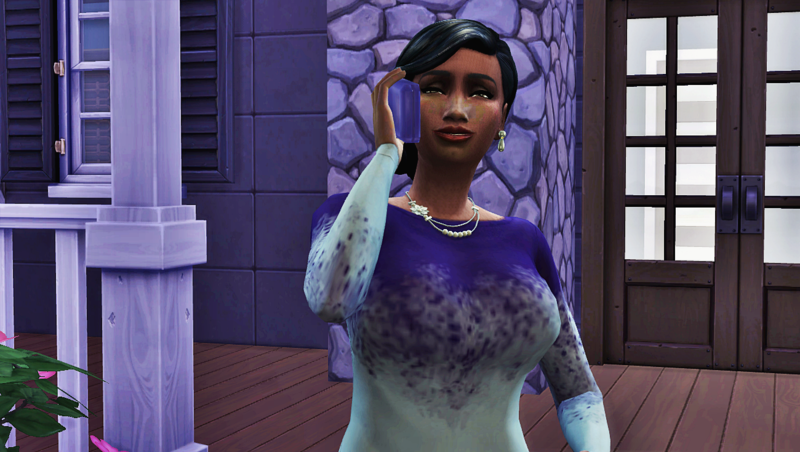 Now heavily pregnant, she decided she would call Bo and have a real talk about the nooboo that would soon join their family. Heaven was about to pull out her phone to call Bo when a sharp pain in her stomach redirected her focus. Heaven: Plum! I wanted to speaking with Bo regarding this pregnancy, and now it is too late. I will have to spring this news on him and have him meet me at the hospital for the delivery. Heaven called Bo, and in between contractions explained that she needed him to meet her at the hospital for the birth of their third child. Bo quickly put two and two together and realized several things all at once. His last time with Heaven was the conception of another nooboo. Heaven hid it from him for some reason. And maybe he was wrong to push her away a few days ago when she came to visit the family. Bo tried not to hope that this nooboo might bring their family back together. Bo headed to the hospital and tried to not let his many conflicting thoughts show on his face. He couldn’t tell how Heaven was feeling. 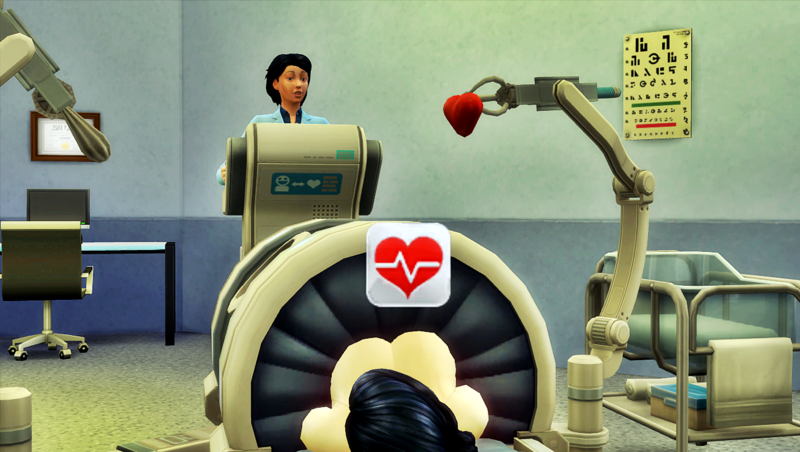 Even in the middle of labor, she was somehow able to control her emotions while outside in full view of nearby Sims. He was impressed in spite of himself. Heaven was taken inside to the delivery room. Bo chose to wait in the waiting room. Once Heaven was secure in the birthing machine, she let her emotions take over. 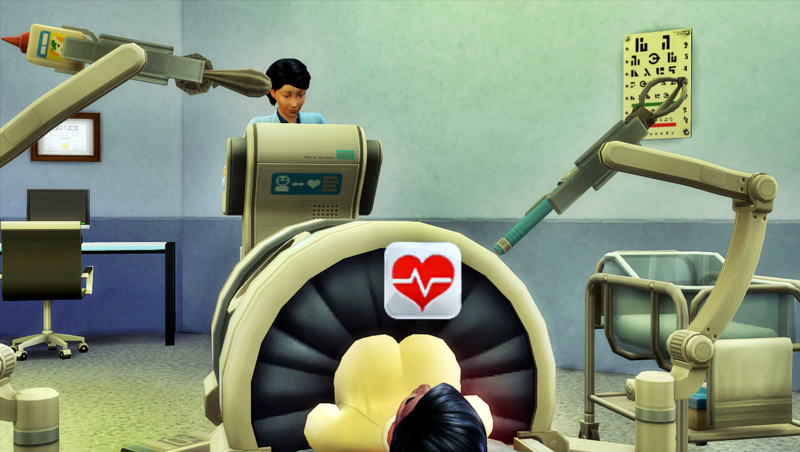 She was pretty sure the doctor couldn’t see her glow, and releasing her hold on herself made her contractions less awful. The doctor who had delivered all the nooboos in town was still somehow mediocre at the job. Like clockwork, she accidentally removed Heaven’s heart. 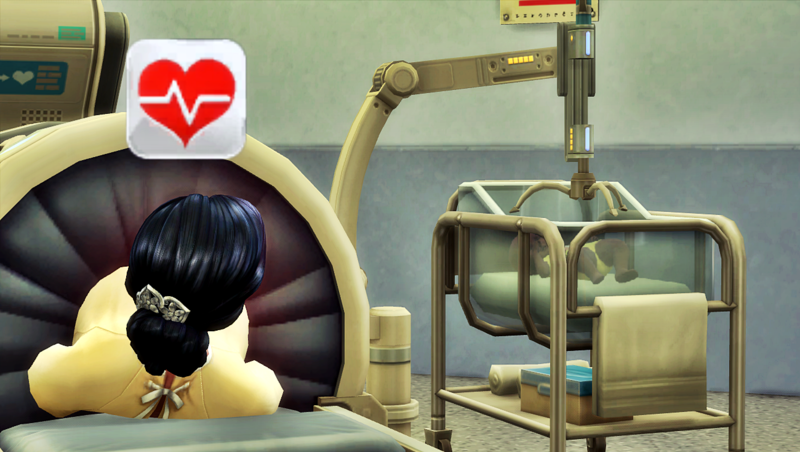 Soon enough, Heaven’s heart was put back where it belonged and the baby was removed to the hospital bassinet. Heaven was still wildly uncomfortable, but for one brief moment, all the endorphins of motherhood took over. She was so happy to see that she had a baby girl who looked… She actually had a very peculiar look. She did not look like a Sixamian nooboo. She looked like a Sim nooboo. She looked like a mix of Heaven’s and Bo’s Sim disguises. Heaven was not sure how to handle what her eyes were seeing. She loved her nooboo nonetheless, but she was visually jarring to look at. 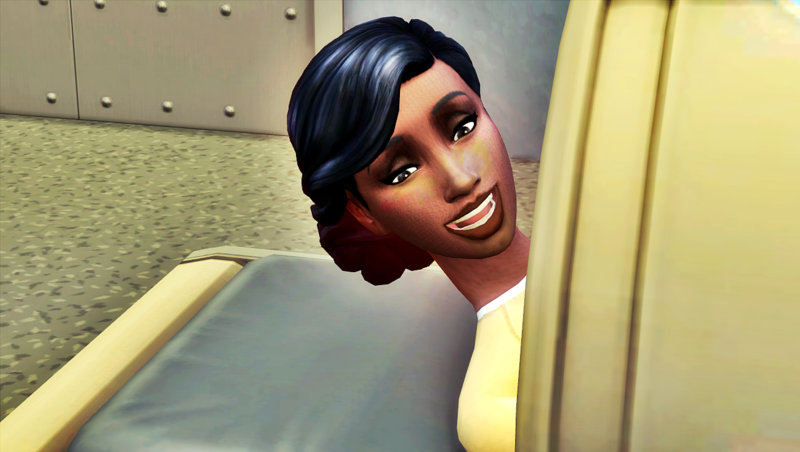 Heaven took the baby home, while Bo headed home to share the news of the delivery with Gem and Asa. The baby’s bassinet was setup in Heaven’s bedroom. Heaven stared down at the infant, who seemed to be drinking in her appearance. This nooboo was more alert than Gem and Asa had been at her age. Heaven couldn’t help but smile at her. Heaven wondered how she would feel about Sky after all the post-delivery hormones wore off. She would not think about that just yet though. She simply wanted to love on her daughter. Inhaling that new baby smell, Heaven sighed. She thought about her options. She could raise the infant she already felt very attached to by herself and deal with the fallout of upsetting her roommates who were clear about not wanting children in the house. Or she could go back home and reunite her family, and she and Bo could raise Sky together. It would be like a fresh start for them as a family. Heaven did not spend much time thinking through her options. Almost as soon as she ran through the options, it became clear to her what she should do. She put Sky back in her bassinet, and headed upstairs to call her family. Heaven stared at her phone for a moment before dialing. It was not her style to struggle with words, but she quickly rehearsed what she would say. She knew Bo would pick up because he was waiting to hear from her about when he could bring their teenagers over to meet Sky. She kept her voice even, and let Bo know they could come over. She did not want to betray what she was planning on saying when they got there. What was most important is that they arrive and fall in love with Sky. If she was lucky, they would also remember how amazing it is to have the whole family together in one space. Little Sky will get lots of love, I promise. All the aliens in my game speak very formally. They learned Simlish in class at school on Sixam, so they are a bit slow to pick up colloquial vernacular. Yay, getting the band back together! Lol, you actually want to get the band back together…? I do! Its so silly. I get it, but Heaven is getting on my nerves lol. Lol, she’s getting on my nerves too. She is one of my most difficult Sims. She is one of the ones who I give constant side eye to. Like bih, stop ruining my story plans! I keep having to follow her lead instead of writing the story that develops in my head. She’s trolling me, I think, haha. She wants to undermine my love for game-driven stories. HA! I feel you on the trolling. How come she doesn’t look like an alien baby ? Nooboos don’t have disguises , do they ? One vote for a fresh start? Got it, lol. I think you’re one of the only ones left rooting for them to get back together. Haha! After the next chapter I really want Bo to move on. To heck with Heaven! Lol, I think her time has to be running short at this point. I mean, how long can a man hold on to a marriage where the other partner literally moved out? ?